Expensive designer bags are turning up everywhere from exclusive boutiques to red carpet events. 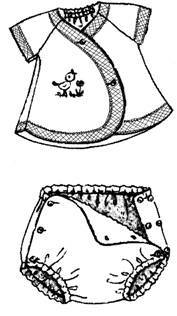 So many students admired Debbie’s Smocked Block purses at the 2006 Fashion Art School that she designed an elegant ivory evening clutch just for them. The ivory dupioni and charmuese envelope flap features three different inserts of North American lattice work each trimmed with delicate gimps. Join her for a day of fabric manipulation fun and learn how to use a combination of pulled and slack stitches to transform flat silks into exciting textural blocks, plus the construction techniques for a professional finish. For those who fell in love with Debbie’s Just Ducky Coordinates (featured in Sew Beautiful) and just had to know how she created a tricolor sea… here is a tiny matching bib to that includes all the techniques used on the romper and sundress! 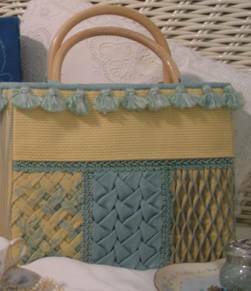 Join Debbie for a day of shadow appliqué and learn how to layer multi-color bands and motifs, reduce your machine stitches to replicate hand sewing, plus perfect bias bands and turn cords ties. In this 6 hour class students make notebook samples, then begin construction of a sweet little piped shadow appliqué bib. 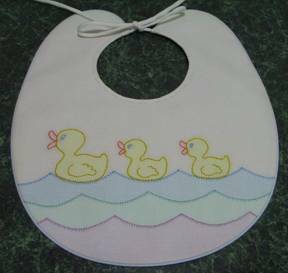 This precious bib with little ducks floating on a tricolor pastel sea is sure to delight a special new mom or grandma in waiting! Add a touch of elegance to your next heirloom project! 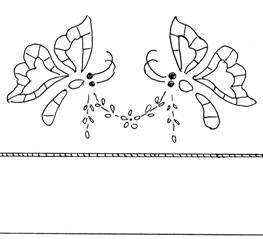 Learn Debbie's secrets for creating beautiful cutwork by machine. Her simple, unique technique eliminates poor stitch quality on bias edges, difficult trimming, unstable bars, and those dreaded stabilizer and fabric fuzzies often associated with machine work. The cutwork butterfly motif which includes delicate Richelieu bars and open work flutters gracefully over the deep pin stitched hem of this special linen tea towel. Banded appliqué edges add a new dimension to sewing. Do you love the look of a satin stitched edge on collars, cuffs, and hems... but never know when to pivot, fear trimming away fabric, or hate the white stabilizer "fuzzies" left along edges. Let designer Debbie Glenn show you all the products and techniques she uses to create beautiful satin stitched edges for Sew Beautiful magazine. Students practice on notebook samples then make a precious pique diaper shirt with a gingham appliquéd edge stitched band designed to keep baby singing sweetly all summer long! Every tiny bundle of joy deserves to leave the hospital dressed in a special garment but often tastes dictate that it’s not too elaborate. 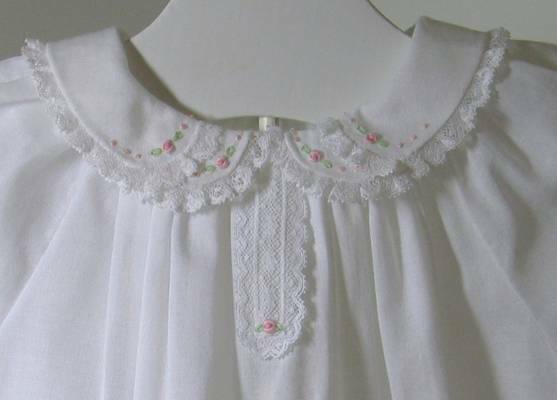 A unique yet simple front lace placket, mock double collar sprinkled with embroidery, and embellished hemline… oodles of delicate lacy details give this sweet white Japanese lawn daygown a true vintage feel. Learn how Debbie’s fine machine techniques transform the difficult task of roll and whipping lace to bias edges a breeze, how to invisibly attach lace to lace, and a special little lace trimmed hem which is absolutely precious but delightfully easy. Whether the floral embroidery is stitched in the softest pastels or understated white, this sweet little daygown is sure to thrill any mother’s heart! Techniques: Applying gathered lace directly to bias fabric edges, shaped lace collar tab, lace trimmed hem, instructor will review basics of hand embroidery as needed. What mother or "grandma to be" could resist making this dress and matching slip for that much awaited bundle of joy! 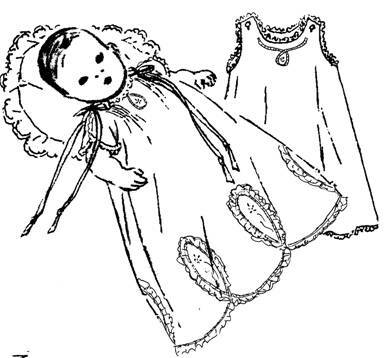 Join Debbie for two days of machine magic and learn how easy it is to recreate turn of the century baby clothes. Students learn how to add shaped appliqué cord motifs, use corded hemstitch to apply lace edging and create a tear drop scalloped hem, stitch one thread release tucks, an entredeux replacement guaranteed to keep neckline lace standing at attention, a super simple folded baby placket with no raw edges, a 30 second machine replacement for hand granitos, plus the “finishing secrets” Debbie uses to make baby garments that are just as beautiful inside as out.. This adorable 1920’s inspired set with it’s lace trimmed petal sleeves, floral embroidered appliqué cord motifs, silk satin ribbon shoulder bows, and lacy loop scalloped hem is sure to be a cherished addition to baby's wardrobe or grandmother’s hope chest! Techniques: Corded hemstitched lace, appliqué cord motifs, one thread release tucks, pin stitched placket, tinest French seams, machine granitos, instructor will happily review basics of hand embroidery (lazy daisy & stem stitch) as needed.